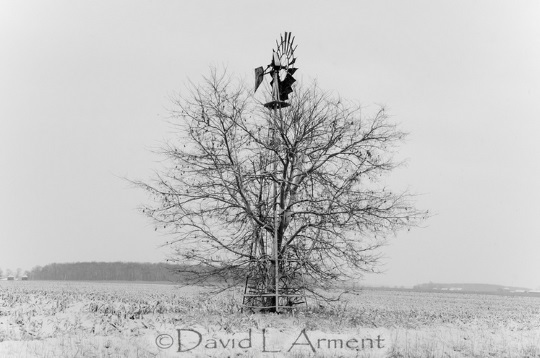 David Arment and his wife Pam are photographers living in northern Indiana. 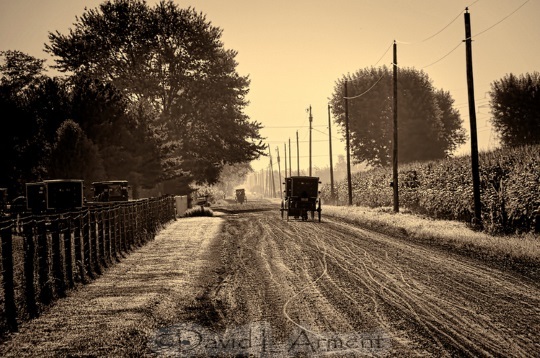 In today’s Q-and-A, David discusses his craft, including how he takes his photos and what life is like in one of America’s largest Amish settlements. I also asked David to share the stories behind a selection of his photos. I love the behind-the-scenes info he shares here. You can order images online at armentphoto.com. Arment Photography is a new sponsor of this site, so we appreciate your support. If you’re looking for a gift or for a beautiful image for your wall, you’ll find a lot to choose from at their site and store. I was the high school photographer in 1968 -1970. Obviously the equipment was much different then. It was a good time to learn and understand how a camera works because we used light meters and had to figure out in our heads what the exposure settings should be. We also had to focus “by hand” (which I think maybe I preferred). The high school sent the film off and magically and mysteriously pictures would return. I bought my own camera when I went to college and have had it as a hobby “off and on again” ever since. I’ve had a dark room in years gone by as well. That also teaches you a lot… more about cropping and dodging and burning than maybe anything else that will translate to the new digital age we are in. I DO like the digital age we are in. And I hate the digital age we are in. I LOVE the manipulations you can make to a photo. I love being able to take a trash can out of a scene where the Amish buggy is so as not to distract from that subject. And I love the background and textures that can be used. I use Photoshop (of course) and Topaz Labs “plug ins”. I use the later pretty extensively. I shoot RAW format almost exclusively and that requires you to then post process every image you want to move forward with. RAW captures a lot of data and allows you to do a great deal with the photo. Because of this post processing of every image then Topaz Labs is a part of almost every image. … and I hate the digital age because everyone has a camera in their phone. They have no idea how it works. Or they have a cheap digital camera and they have no idea how it works. Or they have a new DSLR and they have no idea how it works. BUT they have X number of mega-pixels, which is obviously good because it is better than some number less than X… but they don’t know what a mega pixel is or how it works. As an Amish lady once told my wife “we have to stay up with the times”! Sometimes I read things posted on photographer’s bios. They talk about metaphysical things like their soul, or the soul of the building they just took a picture of… they have lots of big words that really are very amazing in terms of how they describe what they see and how they take their pictures. I am not so elegant in my response. Seeing a picture is fun and it is both easy and hard. I like seeing the small detail, a portion of something that others may miss. On the other hand, you have to “stand back” and be sure you are not lost among the trees and forget to see the forest… almost literally. For example, I have a really good picture of a grizzly bear asleep. He is snoring. Zonked. Gone. Good picture. But when I pulled back I realized I could get this sleeping bear AND Mount McKinley in the background. The second image is entirely different and a much more impactful image. There is an advantage of knowing how the camera works when you take photos. My wife can see the composition but she doesn’t know how to get both the foreground subject and the background subject (if there are two subjects) into focus. Sometimes the subject just surprises you and appears and you don’t have time to make adjustments, but that is rare, so knowing how the camera works helps get the picture you want. It is underexposed out of the camera so the pants on the line are siloutees, but I was able to paint in some detail on the corn crib and other subjects on the ground that would otherwise (in a normal JPEG image) lost in shadows. The subject of the photos reveal themselves… normally. You just have to be open. What is it like living in one of the largest Amish communities in America? Any interesting stories? I grew up in Missouri. I moved to Northern Indiana several years ago and worked in a business in Elkhart, IN and did not interact with the Amish. My wife divorced me several years ago and I remarried. My new wife had a house in Millersburg, IN and had Amish neighbors all around. Her dad was Amish as a child. So about 6 or so years ago I got to start to know Amih people personally. In fact my wife and I were shunned. She was divorced by her husband and I was divorced by my wife, but that does not matter. The Amish bishop was our next door neighbor and he put the world out that we were to be shunned because we were both divorced and then remarried. This shocked a lot of Amish because they had never heard of Amish shunning non-Amish. As time went by the bishop next door softened up and we more or less got things back to normal (whatever normal is). But it was an interesting turn of events. Just a few days ago we were invited back to our old place (15 acres with a big house in the woods) where the new owners continued the tradition of the Summer neighborhood get together. All the kids go into the pond; they feed the fish and generally just run around. It is always fun to see the young ones who talk to their parents in German and just look at us funny when we speak to them. 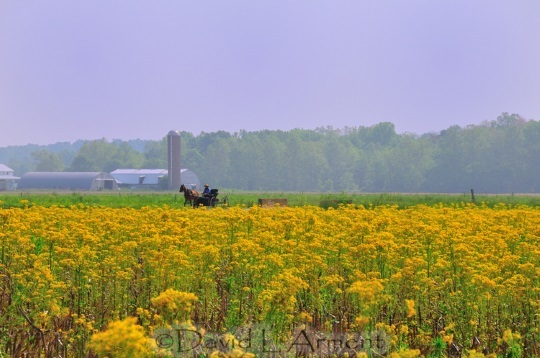 Most or many of the Amish around here work during the day at the RV plants. They start early and get off early. They farm from about 2:30 in the afternoon until dark. Recently an Amish guy who lives here in town (my little gallery is in town) came up to me and started telling me about his trip to Ohio to a funeral. He told me how backward the Amish there are. It simply struck me as very funny how Amish look at others as backward. Also, as you may know, here the “rules” evolve. Rules on phone usage have changed. Now phone huts are spotted here and there and used by households. If you own a business you may be allowed to have a cell phone, or even a phone that rings in the office. And here some can use “skid loaders” or “bob cats”. Once the bishop says that is okay then there are no skid loaders to buy for miles around. Then you get to see how inventive one can be farming with a skid loader. So as you can see, “yes” I have lots of stories. As you know we opened a little gallery in downtown Shipshewana. The idea was to offer primarily Amish themed pictures to tourist as souvenir of their visit to Shipshewana. So they are our current and growing customer base. Having said that, the gallery is selling a lot more non-Amish pictures than I expected. So the current course correction is to increase the proportion of non-Amish pictures. BUT, it is best to be known for something and to have a niche. As photographers we (my wife and I) are trying our best to niche ourselves as offering high quality Amish – themed pictures. As a gallery, the idea is a little different. We want to offer not only photographs but other goods made locally. There is one other gallery here in town and they are a very popular destination, but they do not offer locally produced art. The town itself has its tourist roots in the “flea market”. This is not an “artsy” town. The flea market was local folks bringing in their wares (handmade what-nots) or spare and unwanted things to sell. As the numbers of people increased then the “made in China” products increased in number. Now the “flea market” is in decline as the tourists did not come to buy the latest antiques made last week in China. Go figure. Our gallery is at 125 N Morton Street in Shipshewana, Indiana. I think we gravitate toward anything old. Old Barns, Old Bridges, Old Houses, Abandon Churches, and anything having to do with being out of doors. 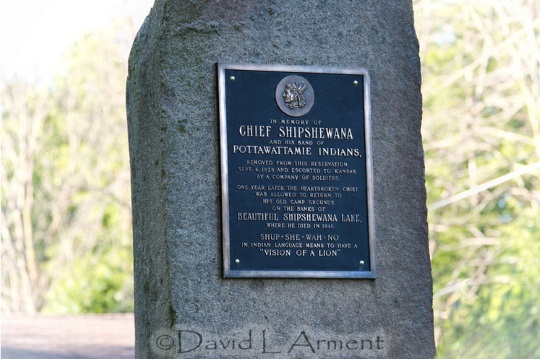 What is something people may not know about Shipshewana? There is a little lake west of town fittingly called “Lake Shipshewana”. It has a plaque where the road goes down toward the lake. It has the story of the local Indian tribe that lived on the little lake. It is a sad story. I don’t think most people know there is a lake. 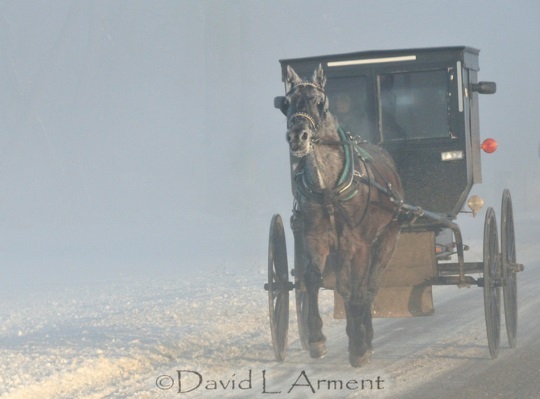 This is simply a picture of a very cold horse and a very cold buggy on a very cold day. There is a tree that was removed from the picture that didn’t add anything. As you may have noted, I have lots of winter buggy pictures because I like the contrast of the black buggies and the white snow. And sometimes I like the starkness of the open fields and this lone buggy out there all by itself battling to get home. This is “Paul’s Windmill”. Paul went to church with us in Millersburg. He said people often asked him why he never took the tree out. He said the tree is what saved / saves the windmill. So I guess the windmill and the tree have a symbiotic relationship. In this same field there is another tree and there used to be a red tail hawk who sat in it. It must have been the center of his territory. This is a recent photo. 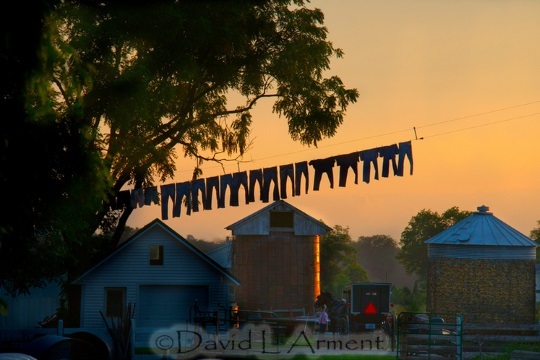 Many of the Amish here have pulley systems that raise the laundry from the house way up high to the barn. I don’t know why this is any better than hanging the laundry on a line that you can reach from the ground. I always wanted to get a good shot that shows this. Up until this shot they were all just “informational”, there was no beauty or interest to the picture. This one was taken at sundown. Everything was dark and the pants were silhouetted. We were able to pull out the detail in the other subjects by dodging them in with a history brush. This is Lancaster county PA. There was a produce auction near the bed and breakfast we were staying at. 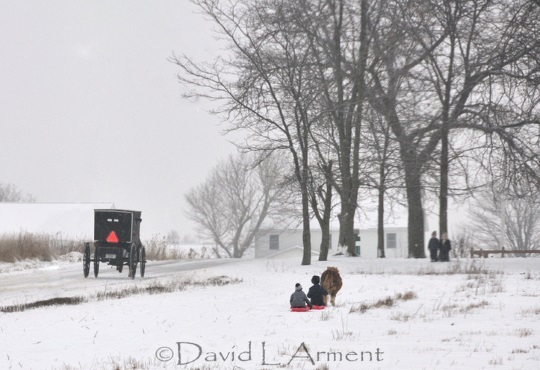 So we got a few pictures of the Amish leaving the auction. So this farmer sold all his produce and is heading home. He had the presence of mind to bring along a chair to sit on for the drive home. This was a trip I made with my wife some time ago to Southern Indiana. This is when I learned how “Amish” she was because she pointed out how the Amish hats were different, the buggies were different, the girls dresses were different. “Different” come out in her discussion as “wrong”. They had somehow just gotten it all wrong. Only the Amish in Northern Indiana know how to dress correctly. Anyway, this fellow was driving his “wrong” buggy, with his “wrong” hat past this filed of yellow. I think the yellow field was “right”. This sign no longer exists. It has been replaced by a new and improved sign. Most of the Amish here work in the RV factories during the day and farm in the afternoon until dark. Some who don’t have large plots of land do other things. Like repair washing machines, or make wooden toys, or sell this or that. There are lots and lots of small, home businesses. 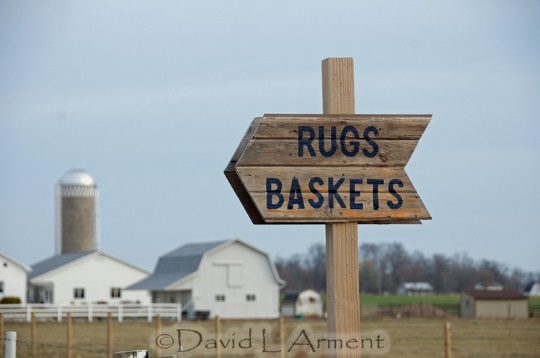 This one I would guess is an Amish lady who is making rugs to sell and this was their rather rustic sign. This is one of my favorite photos, but I like the black and white version better. I like this photo and others like it, where you see the general subject, but then you also see that there are kids waiting at the top of the hill. And you then look again at the size of the small horse… there are just a lot of things that are going on that draw you into the picture. I wonder where the rope is that is pulling the second child on his inner tube? I like the B&W version because the inner tubes they are being pulled on upset my visual balance. In the B&W version everything is more “even”. A couple of things about this picture. First, it is a newer picture. Second, note the different colors of the road. Here they oil the gravel roads that are around the houses to keep the dust down. It works really well. I wonder why they don’t do the entire road? Finally, you can push things too far with the software and this one is on the edge of being too detailed in some of the foreground and the tree leaves. And, although no one cares… there is also some adjustment to the neutral density to get a darker effect on the edges to lead your eye to the subject, without using a vignette effect. 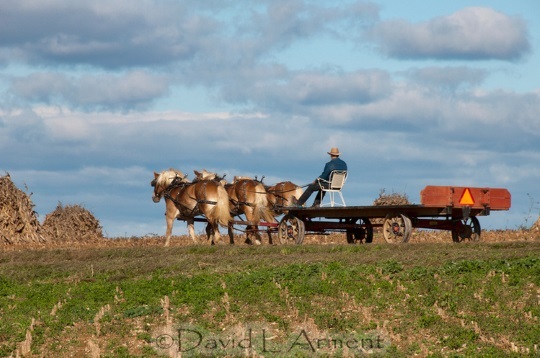 I love taking pictures of Amish plowing. It is hard to do so and not get their faces… so this picture is a “home run” in my book. He must have just turned the corner and headed back across the field as he was close to the road. Did you see the vice grips? I love this picture. A year ago we were in Alaska. We went on a day trip from Seward to see the glaciers. About 15 minutes into the 8 hour day my wife got sea sick. For the remainder of the trip if you said the word “boat” she would turn green. This is a picture of a glacier Aialik. 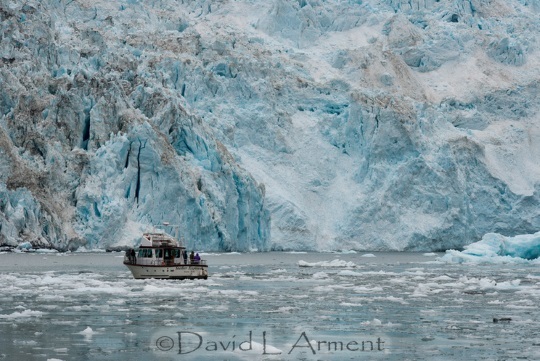 The boat in the foreground is suppose to give you an idea of how massive the glacier is… but it does not, because that boat continued toward the face of the glacier, and it got smaller, and smaller and smaller, until you could barely make out the people standing along the railing. And out in the water are little sea animals laying on the ice as content as can be. The ice water is warm to them I think. 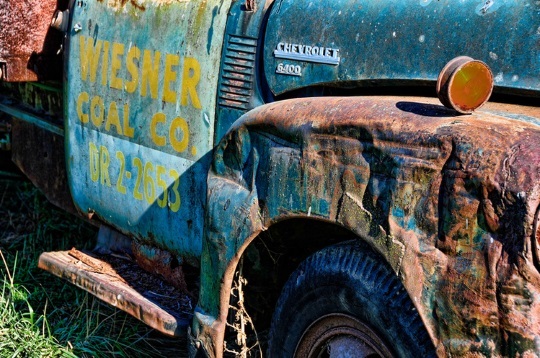 This is an old coal truck, and an old picture… maybe 6 years old. The truck is alongside the highway on the Illinois side of the Missisppi River North of Quincy, IL. I like the telephone number, and how the sun has faded the blue. 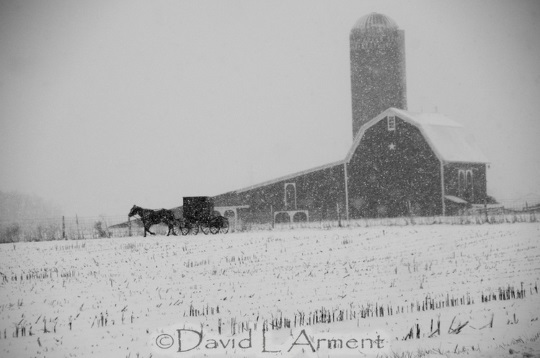 View David and Pam Arment’s image galleries at Arment Photo. I’ve NEVER heard of someone who is not a church member (Amish) being shunned… How can a person be shunned from a church he was never a member of??? I really like the windmill & tree picture! A good question and the description caught my eye too Mark, though I interpreted “shunning” more as a figure of speech. 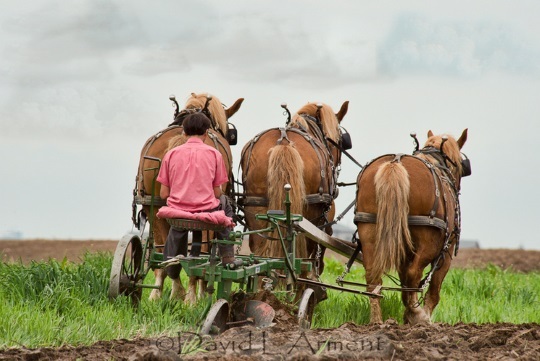 Members of an Amish church can certainly disassociate, avoid, or treat differently a non-member for whatever reason, even if it is not technically “shunning”–just like I may choose to avoid any person I feel is a bad influence or simply don’t like personally. I know an English person who experienced something like this in a different community for different reasons. I can ask David if he has anything to add. I did also like how he went more in-depth here about the nuts and bolts of photography. The effect of shunning was a big issue for my wife. Not so much for me. The reason was that, as I said my wife divorced me and Pam (my wife) husband had divorced her. When we married we moved into her house which was on 15 acres and we had many Amish neighbors. The neighbor to our immediate North was the local Bishop. He was the person who instructed we be shunned. Since I didn’t know anyone I had not idea what was “normal” as everything was new to me. But the stopped visiting our place, stopped sending cards at birthdays (etc.). Would not talk to Pam (or me) when they normally would have. So Pam’s feeling were hurt. She normally had a neighborhood picnic and everyone for miles around would come and swim in the pond and feed the fish and wade in the creek, and run in the grass. She skipped it for a couple of years due to the shunning. As I think I said… Some Amish were as mystified as we were, and would say to us how can you be shunned? You are not Amish. As time went on Pam continued to take over flowers from her garden and send cards trying to keep some normalcy. So as time went on the Sunning seemed to go away. We went to see a newborn. This was the son of the Bishop who shunned us. When he saw our car he and his wife came over and we all had a wonderful visit. Time has a way of healing most wounds. I hoped that was helpful to you. I know David and Pam personally; they are the salt of the earth! David has been very generous in sharing with me when I started a local digital magazine called inMiddlebury.com. I continue to support them in whatever way I can, as they are wonderful, caring people. You will not be disappointed if you visit their gallery or website. Their gallery is located in Shipshewana off of Morton Street in what is called “The Courtyard of Arts” where 3-5 small cabin-style shops are located in a square. Thanks for sharing about David and Pam! Tammy is a real peach. She has been front row center to see some of my personal struggles and with God’s help I survived some times when I would just as soon have “gone on home”. Thanks Tammy for your support. It means a lot. Love all the pictures you shared with us. Really enjoyed reading your comments on the pictures as well. Thanks for your kind comments. I hope you had a nice weekend and will have a good week. Some really cool stuff here, David. I just regret that we didn’t know about your shop in our recent visit to Shipshewana. It’s not too late–go online! (No, David is not paying me to say this. 🙂 I just believe in him! Oh, didn’t mean to say that it was too late to view (which I have done) or purchase his stuff. My point was that I would have enjoyed meeting him personally and “talking shop” photographer-to-photographer. I hope you will come and visit us on your next visit to Shipshe. Beautiful photos, but I still like “nitty gritty” reality over photoshopped images. (I guess I like “documentary” photos over “art” photos. I almost wish I didn’t know what was changed. I like most of the shots, and intend to “shop” their website. My husband took up photography over 40 years ago, using a Nikkormat (couldn’t afford the Nikon he really wanted). Many were the hours I spent waiting for him to be done using our (then) one and only bathroom as a darkroom. Nowadays, he uses mainly video (choosing stills) and digital photography along with photoshop and various other modern photography “tools”. We have countless shots (on DVD, mostly) of our 2 granddaughters, ages 1 & 3—many more, I’m sure, than our own parents ever took of us as kids. To me, too many is worse than too few (which become more precious as time goes on). A dilemma, for me! The photo with the laundry took me by surprise, as the silhouette of the laundry against the sky looked like the teeth of a sawblade. Thank you for sharing your photos and your comments & descriptions. You and your wife are artists, after all, not documentary filmmakers! 🙂 If I’m ever back in Shipshe, I hope to stop in and meet you both! Erik, this one’s a keeper! Loved reading this…thanks for sharing! Wonderful Pictures……thanks so much for sharing. Good photographers know that composing the picture is an important part of photography. Also, I have taken out lots of telephone poles using Photoshop. I can also relate to what was said about photography of today. Several friends say I am crazy to lug around a tripod and such a heavy camera when (they think) their iPhone can take just as good a pictures…..NOT. Perhaps I can say I am a semi-pro only because I understand all the settings of my Canon 7D and there are lots of possible settings. My biggest frustration is having to pass up some wonderful shots because I refuse to take a facial picture of any Amish. One day I was out in the country and my wife was driving. A dozen Amish kids were sitting on a fence and when we got close they all waved at me. What a shot that would have made. I worked on a photo last night of a handmade sign that was advertising brown eggs for sale. I couldn’t decide whether or not to remove some telephone poles and I remember this post and it inspired me to go ahead and do it. Telephone poles are a menace. A lot harder to remove that “road apples” that the horses leave behind… but you can leave some telephone poles, but you cant leave much or many “road apples”. Thank you David for sharing these beautiful photographs! I learned a few tips to produce more creative digital photography as well! I am looking forward to visiting your gallery – hopefully this fall. God Bless! I am happy to help anyone who has questions about photography. The use of Photoshop and “plug ins” is something I really love. But many people simply don’t know how their camera works and they would like to. My Nikon 800 came with a really good book. It is helpful to simply read the book that comes with the camera. Cameras, these days, are really cameras AND computers. They record the information and you then coax it out of the camera with software. So it helps to know the basics of photography and then to know how your particular camera processes the information. To me… the basics are speed and light. If you have a lot of light then you can have fast speed (low ISO and / or fast shutter). If you have little light then you need slower speed (high ISO / slow shutter. The first thing to learn is how speed and light work on the film (or sensor) in the camera. How you adjust for the speed for light. After you get those two things figured out the other things fall in line (priority wise)… but I don’t teach camera classes or write books on photography so I will kindly defer to anyone who does. Again, I will help where and when asked. I’m going to answer your last question first. The plug ins I use the most are from Topaz Labs. Money is alawyas an issue (for me). If you can just afford one then go for the “Detail” plug in. I use the regular Photoshop. I used Elements for a long time once and had good success with it. I don’t teach people how to use there camera or write books. I just know what I think I know. I’m glad to help people but there are better experts than me. There are settings on my camera that are the ones you set and don’t mess with (normally speaking) from “shot to shot”) On my Nikon these are the “Shooting Menu”. This is where you set White Balance, Active D-Lighting, ISO sensitivity, Auto Distortion Control etc. On my camera there is a short explanation for each setting if you push the button for explanation (which is represented by the question mark). But you question refers to the program mode so I think you are asking how my camera is set up from shot to shot. First I only shoot RAW. I used to switch it back and forth depending upon what the shot was going to be used for. If you are taking a picture of a sunset and you want a full range of color then raw is best. If you are taking a picture of an item to put on Ebay then RAW is “over kill”… so I would switch back and forth. BUT, then I would take a wonderful, wonderful picture of something only to find I’d never moved the quality setting back to RAW, so now I just leave it set there. I also shoot a lot in “program” mode, only moving the ISO for the light at a given time of day. If the sujbect is in shadows then I move the light meter setting from a broad spectrum to a more narrow spectrum or even on point of light reading. I don’t know if you camera has that setting. I also adjust the focus settings a lot from shot to shot. Depending upon the shot. If there is a horse in the middle of the field and I only really care about him being in focus then I will adjust those settings. On rare occasion when you want something to be blurred or you want to shoot fireworks then you would adjust your shutter speed. Which would take you “off program”. I suggest you take your camera off program and experiment. The nice thing about digital is it cost you nothing to do so… you just throw away the bad images. 1) I shoot a Nikon D7100. I now only shoot RAW + JPEG, have shot almost exclusively in Program mode from day one. (I have experimented with the others, but came back to P as my default.) However, some situations of late have proven to not be so P friendly — namely what feels to be too weighted toward to faster-shutter-speed / lower f-stop end of the spectrum. (I wish there was a setting that would allow me to “shift” that default.) I have loved — and used quite extensively — the rear-thumbwheel for altering the f-stop-to-shutter-speed balance, but am just wondering if there is an alternative set-it-and-forget-it option. Lately I’ve gone “off program,” as you say, opting for Aperture Priority with a default to something in the 6-7 range — with some result markedly better, and some not so much so. 2) I’m curious about the range of ISO settings that you use and find acceptable. Going back to film days I shot only 64 or 100 ASA, and I’m having trouble trusting the camera for quality above the very lowest ISO settings. The ads say that the D7100 is supposed to be superior to previous models in quality for some of the mid-range ISO’s, but I was wondering if a professional camera jockey would agree with that. I see I didn’t respond to this one. I didn’t get a notice that you had posted. No, never to late for me to learn how to do better. I would still love to hear any insights you would be interested in sharing. Since I posted that in July I have invested in three larger books on my camera, and they have been a tremendous help and I’m feeling some better about the quality I’m getting out of my camera. But I’m always open for ways to make it even better. I don’t know the answer to all these issues. I have shifted my thinking on ISO settings of recent. For years I’ve always set the ISO “manually”, but once in a while I miss a shot because I’ve go the ISO too low. So on my camera there is an Iso setting that only “kicks in” when the ISO setting is too low for the available light. It compensates and goes to an ISO setting that is more likely to produce a good result. So that is what I’m doing now… unless I just know I want something different. My camera also has a separate function that overrides the automatic settings by letting you decrease the stop in increments. So lets say it is near dark and you are in a program mode. You release the shutter and you get an exposure that is just like mid-day. That would be fine if it were mid-day, but it isn’t. So you can use this function to stop down (or stop up) and make an evening shot look like an evening shot. I’m not a professional. I’m someone who is obsessed enough to stop what he was doing to do what he’s obsessed with. My decision to do this “full time” came when I died on an airplane during a business trip. When I was revived and in the days that followed I decided to do what I loved because “time is short”. If I may add an new question to the mix…. Do you use a tripod, or hand-held? (Which gets back into the ISO question I asked earlier.) 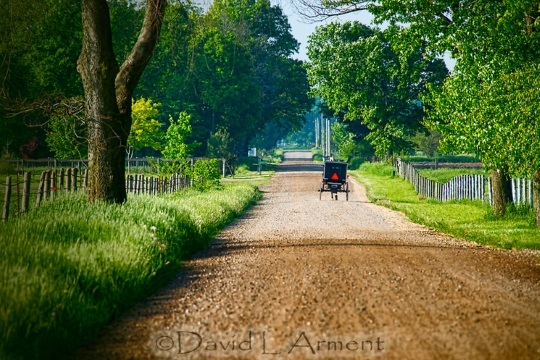 Do you do your photography “on the sly” (“snatching” up your camera after the buggy goes by so as to not ‘bother’ the Amish), or do you set there with tripod set up, wave as they go by, then take the picture as they get into a shootable position? To me it seems if you know the people being photographed might not like it, either way would be disrespectful. Mark, I understand and appreciate your comment. But understand that my question (to which you responded to) was strictly asked from the perspective of the mechanics of taking the shot, not so much the ethics side of it. I’m not saying that I go by such loose guidelines. In fact, rarely will I take a picture if I know that an Amish person will know that I’m taking it. But when you say that it is disrespectful when “someone might not like it” — well, I’m finding more and more that makes me wonder just how much many of the might not. Your insight/response to this is more than welcome. As with all things Amish… the answer is “it depends”. Here – in Northern Indiana – we are not suppose to take pictures of faces. So (hopefully) you won’t see any of my pictures with Amish faces. And as with all things Amish, that’s the way it is here TODAY. We will see about tomorrow when it gets here. You could ask different people and get different responses even within a group. For example, while I don’t find it overly-offensive I still don’t like it but my wife really dislikes it and it makes her very uncomfortable. In our group you’ll find a variety of opinions from those who don’t mind posing at all to those who find it very offensive to be photographed. There are also Amish groups in our community who are very opposed to it. So just like in any large group of humans, there may be a difference in feelings & opinions. It’s worth pointing out I have my photo on my Ohio non-driver ID and my passport, so it’s obviously not a religious issue for me, but it’s my own feeling formed from living in a community that gets over 4 million tourists a year, many of whom want to take pictures. I guess it just gets to be intrusive and since many of these people seem to know there is a chance the person being photographed might not like it, it can feel disrespectful to some people. Sorry David, we are so many branches in this thread that I can no comment directly on your comment, and thus have to back up to the previous branch. Interesting comment on the “no faces” rule there. I say “interesting” because within the last 2-3 weeks I was told by in ex-Amish from Shipshewana that the folks there were so used to the tourists that it wasn’t a problem. So like you imply, the only norm is that there is no norm. 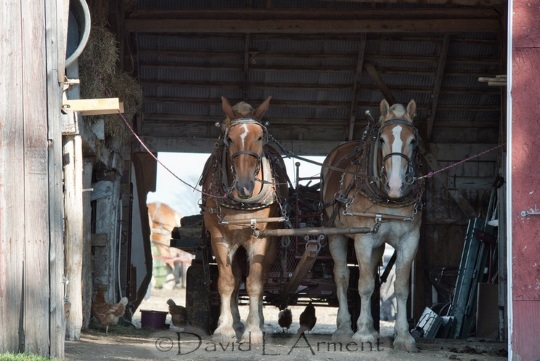 A few years back I viewed at a frame shop a beautiful picture or photo of horses pulling logs in the woods. What caught my eye is the breathing of the horses. You could actually see the air of the horses breathing from their nostrils. I thought it was very unusual. Is it possible you can catch or click on a scene where the horses are hard at work. Of course this was a winter scene but it felt like I was right there viewing the action. Oh, by the way, your wife should have worn a patch for the sea sickness in Alaska. Saved me. LUV Alaska. Erik: Are there any Amish that are toughing it out in Alaska? I went through and looked at those pictures where I could see the horse’s breath… here is what I found… maybe I missed a couple? We watched a movie (?) on Netflix last night. It was a low budget “do it yourself” almost type movie of a guy and his “significant others” trip to Alaska. When they got to Haines my wife said she thought she could do a boat in Haines as it didn’t look as rough. So maybe we will try it again… but I think the patch is an excellent idea!!!! We saw Amish in Alaska and in Canada who were on vacation. One group was combining business and vacation. Each time my wife would go up and talk to them and ask them where they were from etc. We didn’t see any living there. Thanks for your kind comments and suggestions.